2018 - The most successful year to date for New England food startups! Entrepreneurs in the greater Boston area are accomplishing incredible things, like mapping the global food supply chain, landing major funding for robot restaurants in partnership with culinary celebrities, leading positive food system change through new food recovery initiatives, creating novel biofilms, and a whole host of others are inspiring massive food industry evolution. Branchfood isn’t the only one to notice either! This past year, we launched Branch Venture Group - a network of angel investors seeking to fund food startups and made four investments to date! Branch Venture Group’s portfolio currently includes Open City, Willie’s Superbrew, Waku, and Ocean Approved. We thrilled with the achievements in our community, and while we anticipate an even more impactful 2019, we wanted to highlight some of our events from the past year and reflect on the successes of the local food community. Throughout the year, Branchfood hosted a panel series on the Future Of Food that dove into various aspects of the food system including: food allergies, agriculture, nutrition, food products, food retail, and brewing. On January 24th of 2019 we will continue this series with the Future of Cannabis. In May, Branchfood teamed up with the Boston Globe and Hill Holiday to host Food Edge, a two-day summit in May that explored the future of food and guided brands that wanted to be leaders in the industries of the future on finding their innovative edge. Food Edge is a first-of-its-kind summit that brings together the food industry’s largest brands, alongside dynamic startups and disruptive leaders, to help you find your brand’s edge. It was a packed two days of inspiring speakers, innovation workshops, and fireside chats, that explored the trends, strategies, and capabilities of what could become a brand’s edge in the marketplace. In June Branchfood hosted a discussion on angel investment for high-growth food startups. Attendees heard from investors on what financing food is all about what they look for in investments. They also shared the terminology used by angel investors and venture capitalists, reviewed the process for raising funding including timeline expectations, and answered general questions about the fundraising process. On the first Thursday of every month Branchfood held Community Table. - a free event where everyone in the community is welcome to come and share ideas, network, and engage in conversation. We are looking forward to many more Tables to come, and our first one of 2019 will be on Thursday, January 3rd. 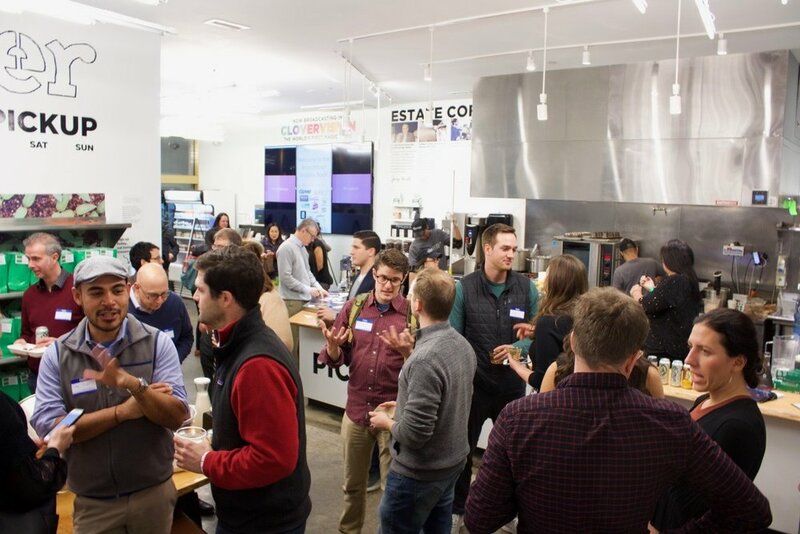 In December, we hosted the Branchfood Annual Holiday Bash at Clover Food Lab in the Financial District. It was a wonderful evening celebration sponsored by our partners Wolf & Company and Brex, including delicious food from Clover, drinks from Nightshift, and samples from the hottest food startups around! It was the perfect way to end the year and celebrate everything that the Boston food scene accomplished in 2018. 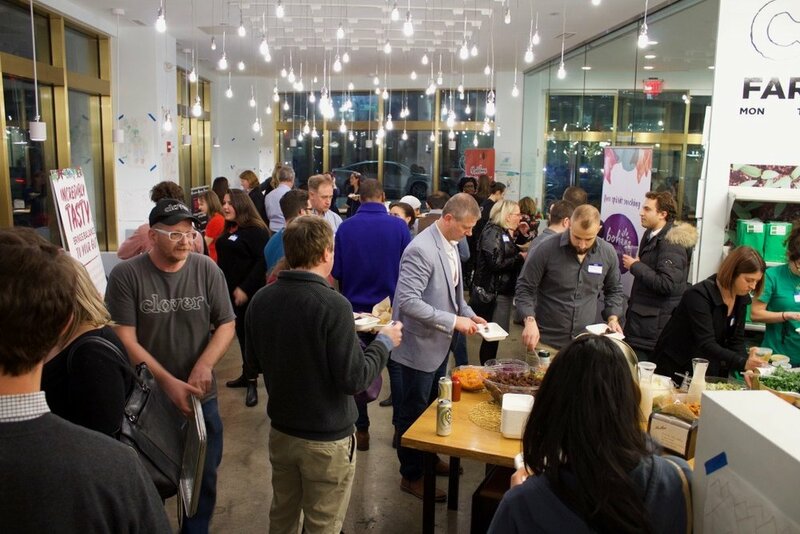 We are very excited to continue developing resources and supporting the community of startups and innovators in the coming year and cannot wait to see what 2019 has in store for Boston food industry. Happy New Year! Our new blog series, “Five Food Startups Winning the Branding Battle,” is all about founders at rising startups in the Branchfood community who are launching the next wave of exciting food brands. We spoke to five incredible founders about product development, branding and marketing, and the success stories they’ve experienced so far. We’re kicking things off with Dale Roseman, CEO and founder of Veggie Table Foods, a maker of healthy twists on familiar foods. In this interview, Dale discussed how she developed her initial concept for her company, what makes her brand unique, and how building a great team became the foundation for her success. This is part 1 of the Five Food Startups Winning the Branding Battle. Check back in two weeks for part 2! What is Veggie Table Foods? Veggie Table Foods is a manufacturer of all-natural, veggie-based, gluten-free, keto-friendly pizza crusts and rolls that are frozen and ready to serve. Right now, we’re focused on serving restaurants, institutional food service, and meal kits. When did you know you had something you could build a business around, as opposed to just an interesting idea? I invented the concept in March 2017. I was making these cauliflower pizza crusts and everyone I knew was asking me to make some for them. I was tired of making so many of the crusts because they’re pretty time consuming. I wanted to buy them, but I couldn’t find anything that was exactly like what I was making. We’ve been going full speed since last May. What are some concrete steps you took to go from idea to product, to something that can scale? My first step was hiring an advisor that understood food and startups. I was lucky to find a single person who fit that bill the very night I pitched. She’s been instrumental in everything we’ve done. She’s by my side, making sure I’m not wasting time on things that don’t help the business. I also went to the WIN Lab at Babson College - they were my second big source of support. From there, I hired industry and food experts that were in my space. Hiring the right people helped shape the business from the start. Essentially, I hired good people, then decided on the strategy. I’ve been in the retail space for a long time, but I needed a team with experience with the food industry - negotiating, cost control, etc. We originally wanted to go into retail, but all of my advisors suggested against it because of how difficult it is to succeed in such a crowded space. They wanted us to prove the concept in food service before we went into retail. Can you share your process for gathering feedback and turning it into actionable steps for your own product development? The product came together fairly quickly, but we’ve had to change our items a bit. We started with cauliflower pizza crust, which everyone knows of. We had other items like cauliflower rolls where people didn’t quite understand what it was. We did as many trade shows as possible where we could meet people who were putting food on restaurant menus, distributors, etc. and ask them for direct feedback about the taste, the size, the texture, and every other criteria that needs to be met for a successful product. Then we found a space - casual dining - and we kept testing to see if that space was right for us. What food brands have been most influential to you? There’s so many emerging brands that are amazing. They start small and explode from there. Biena Snacks is one of my favorite stories. My competitors are also who I think of as a starting point for what I do. Bohana [Editor’s Note: Bohana’s story will be featured in part 5 of this series] is also incredible. They took something that didn’t exist in the U.S. market and made it understandable. If you like popcorn or potato chips, you’ll like it. We’re all providing a healthy twist on our customers’ favorite food. Can we make a healthy version of what people already love? That’s what we’re trying to do. What makes your brand unique and different from your competitors? My two biggest competitors use the word “cauliflower” in their names. They’ve essentially pigeonholed themselves as a cauliflower brand. Veggie Table Foods can include cauliflower, but we can also do other veggie-based products without confusing our customers. We want to be the standard for all veggie-based products that can be baked into a healthy treat, all while adhering to being certified gluten-free company with the best ingredients. Can you share the most impactful strategies you’ve used so far to grow your business? I’m very old school, I build through relationships - knocking on doors and finding partners who trust our products and me. From manufacturing and distributing to finding investors, I’ve made contacts who want to help. It’s all about forging a real relationship with the best partners you can. What success story are you most proud of? I’m most proud that I just went out of my comfort zone. I’ve gone to events beyond my company’s size because I knew I could meet the best people for my business. I’m stepping out and seeing where I want to be next year, and I’m showcasing my company and products as if we’re there already. You had no startup experience when you started. What advice would you give to someone who has an idea but no startup experience to help them get over the initial barriers of starting a business? Do as much research as possible. Be focused. Before I met anyone who helped with Veggie Table Foods, I actually bought books off Amazon about starting specialty food business, how to start a food business while you’re working, how to work with manufacturers. I’d say to read a lot. You may not think you know someone who can help, but if you ask around to anyone you can think of, someone will know someone who can help. You’ll find that the more people you talk to, you’ll learn a lot and understand things. Always look to meet people who can help in some way, even if it’s just for advice. Find an accelerator program. There’s so many that are as short as 4 weeks and some that go up to a year long. Find one and get in. It’s strategic and targeted and you’ll learn everything you need to know. There are mentors who will help you for free. If you do nothing else I’ve said, do this. Your product essentially didn’t exist before. Can you share some insight into your process of selecting a manufacturer to create a new product and working with them to get the recipe just right? It’s very difficult. I hired a consultant who could find a manufacturer who could make what I was doing at home. We found a boutique manufacturer that was focused on food startups where we could take our product to the first thousand batches. It’s expensive and it’s exhausting to get to big production runs without sacrificing quality. We spoke to 85 manufacturers and about 83 said no outright. It was about finding a manufacturer who can grow and scale with me. I had to find someone who would take a chance on something they don’t understand at first. I’d say don’t pick the big huge guys when you’re starting out - they cost too much. Find an equal in size who can work with you while you’re working out the kinks. You’ve been a health and wellness coach for a long time. Do you see an additional side to Veggie Table Foods that combines your content from coaching with the products? Yes. This started with me making the cauliflower crust for the women I was coaching. When I found the perfect recipe, my clients were asking me to make it for them because it’s hard and they didn’t want to do it themselves. I started making a bunch and freezing them. That started a small blog series that included the recipes. I walked away from that for now, but people really want to know how the food fits into their health/wellness plan. I think people want more than the product, we want to show them how we fit into the big picture of their health and wellness journey through our content. This interview was conducted and written by Ideometry, an all-in-one growth marketing agency helping everyone from startups to Fortune 500 companies engineer brilliant integrated campaigns, find their ideal audience, fuel their pipeline, and drive real success. There’s no one recipe for success in the food industry. The space is crowded and many verticals are dominated by massive corporations. How can a startup food brand succeed? This is the question we put to five startup founders at Branchfood, our community that promotes food entrepreneurship and innovation. Over the next five weeks, we’ll be publishing interviews with a few of the most exciting and promising food brand founders in our community to understand how they’re building standout brands and developing their products. Though each of these founders’ journeys is far from over, they’ve learned a lot that other founders can and should apply to their own businesses. Join us every other week for the next 10 weeks as we release new interviews from our ‘Five Food Startups Winning the Branding Battle’ series. This series features interviews conducted by Ideometry an all-in-one growth marketing agency helping everyone from startups to Fortune 500 companies engineer brilliant integrated campaigns, find their ideal audience, fuel their pipeline, and drive real success. In the middle of a campaign and need some support? Want to build something awesome from scratch? We’d love to hear from you. Get in touch with us at ideometry.com or at hello@ideometry.com.